Road Conditions: good mountain highways & loose surface back-roads. Scenery: highland valleys, mountains, rice paddies, tea plantations, caves forests & rivers. The Sin Ho trip is a really unique experience and one that really showcases the wonders of Northern Vietnam. Scenically, the route passes through some of the highest peaks and least densely populated areas in the whole country. This trip is not for the fainthearted and is not designed for those seeking a sightseeing tour with lots of creature comforts. If you want to throw yourself in to Vietnamese culture and get well of the beaten track, then this might be the trip for you. Personally, we love it. Built on a small plateau, at an altitude of over 1,000m, Sin Ho is very cool, especially in the evenings. 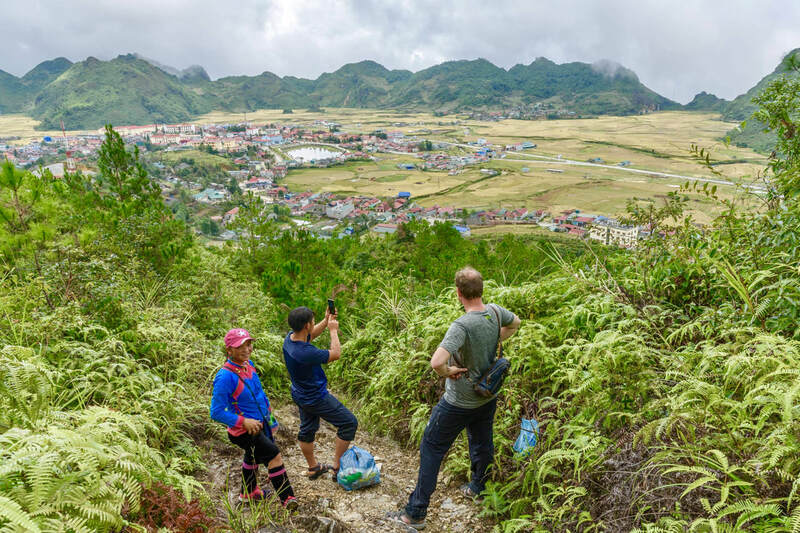 Ringed by limestone pinnacles and surrounded by minority villages scattered over the mountainside, this town offers some of the best places for trekking in all of Vietnam. The impressive, looming presence of Mount Fansipan, Indochina’s highest peak at 3,143 m dominates the scenery all the way to Lai Chau. The Tram Ton Pass winds down through pristine alpine scenery and past the Dong Tien Son cave system. As we drop down into Lai Chau Province, we travel through a numbers of villages home to the Lao Lu and Thai and Dao ethnic minority groups. The scenery is very mountainous, heavily farmed with terraces of rice and corn, and dotted with minority hamlets. Next comes the impossibly scenic and steep ride to Sin Ho. In good weather this route is exceptional. Cutting a path in the mountainside, the single-lane road zig-zags up for 40km to the isolated mountaintop town of Sin Ho. The views over ridges, farmland, ethnic minority villages and clear rivers are superb. A mix of sealed surfaced good roads and single track loose gravel. This adventure begins by driving up past the Silver Waterfall, through the forest of the Hoang Lien Son National park to Heaven's Gate and Tram Ton Pass (the highest road in Vietnam). The route includes some of the most spectacular scenery Northern Vietnam has to offer. As with all ETHOS adventures, this motorbike loop contains much more than riding. There is a strong cultural emphasis with lunch on day one shared together with an hill tribe family. There are a number of variations available within the schedule, with two nights in a local guesthouse possible, as well as combining one night in a guesthouse and another in a traditional homestay. The homestay is a working farm, so the host family will no doubt be tending to seasonal domestic chores while you stay. The homestay is a bustling household and has beds, good blankets and there are mosquito nets available. However, the homestay does not have a toilet or shower. There is an open fire for cooking, which is both cosy and ambient, but also smoky when food is being prepared. As a contrast to the cultural element of this trip, there is also some incredible natural ecosystems, including two spectacular caves that are both the largest and most interesting in North West Vietnam. There is also the option to include some trekking on day two should you wish. There are good walks and more challenging treks available depending on your preferences. Rather than pre-arranging, this is best done while in Sin Ho. You will have an English speaking ethnic minority guide for the duration of your three day trip. This allows for plenty of flexibility within the trip meaning that elements can be changed throughout depending on how you feel, the weather and on what you want to see and experience.